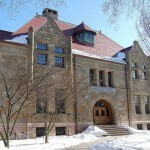 Both private and public California institutions rank well in the University Review College Rankings lists, with notable members in the top 100 colleges list being the private institutions CALTECH (Ranks 5th in the USA), Stanford (6th place), and Pepperdine University (87th), and the public institutions the University of California Berkeley (11th), University of California, San Diego (18th), University of Southern California (30th), University of California Davis (33rd), University of California Irvine (39th), University of California Santa Barbara (53rd), University of California, Santa Cruz (71st), and University of California, Riverside (73rd). Size wise the largest colleges by student body are the California State University, Northridge (33,398 UG students) and California State University, Fullerton (33,116). While the smallest establishments include the California Institute of Integral Studies (75 students) and the San Francisco Conservatory of Music (174 students). Cost wise, of the main higher education establishments the lowest tuition fees are offered by the California State University, Monterey Bay (Instate: $5,963), and California State University, Dominguez Hills ($6,099). The lowest costs for out of state students offered by public bodies are offered by California State University, Long Beach ($12,108). Conversely the highest priced public college in the state is the University of California Irvine ($14,757 In-state tuition fees and $37,635 Out of state fees). 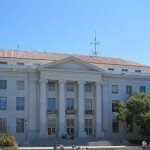 Of the private institutions, the lowest priced establishments in the list of California colleges are the University of the West ($9,486) and the National Hispanic University ($8,196), whilst the most expensive universities in California state are Harvey Mudd College ($48,594) and the University of Southern California ($48,280). The most selective colleges are Stanford (6% acceptance rate) and CALTECH (11%). The oldest colleges in California are the Santa Clara University, University of the Pacific, Notre Dame de Namur University, and the Dominican School of Philosophy & Theology, all established in 1851.